Recently coming across Semiconductor‘s video for Double Adaptor on Osaka Recordings I found a thing of rare digital beauty. It gave me cause to reevaluate their work after viewing a performance by them a number of years ago at the Brighton Dome. I found their work at that time intriguing but not stand out. The execution wasn’t to my taste, and the processing power and software tools were not yet up to the task of what the group wanted to create. A few years makes a world of difference… Ruth Jarman and Joseph Gerhardt have refined their creative process and technique and are creating custom DVD and moving image installations at galleries across Europe infused with a more fine arts-based aesthetic. They’ve moved from being glitch art performancers into a more rarefied air as purveyors of exquisitely realised sonic visuals. In 200 Nanowebbers, vector shapes and painstakingly applied layers of hand-drawn animation evoke a quantum-powered molecular dance. 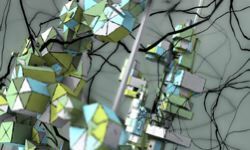 The mutating graphic structure is allied to Double Adaptors live soundtrack using custom-scripted code, to grow and mutate a blossoming pastel-hued web. Matt Hanson: What was the inspiration for 200 Nanowebbers? Semiconductor: We started with the music and the title of the track. For recent real-time performances we have made our own tool so that we can generate 3D structures and life-forms to sound on the fly. During the performance we create a primordial soup and this speedily evolves into landscapes and life-forms. We’re interested in how human and computer come together to form representations of the real world. We call this Artificial Expressionism. So we had already been exploring ideas of microcosms and evolution and wanted to take this further with 200 Nanowebbers. We wanted to try out visual techniques that would make you feel like you were in a Nano-scale world, without having to use other objects as a scale reference. The pace of the track is quite frantic. In all our work we find different ways to unify the sound and image, so it was clear this pace would be reflected in the piece. We rarely make a storyboard. We’re against working with a traditional idea of narrative and often let the sound take over this role. We develop ideas of how something will progress, so we end up with sketches for different parts of the whole; the motion, form, shot and techniques, it becomes a very modular process. For 200 Nanowebbers we broke down the sound into sections. The music was produced as part of a live performance so there was just a stereo version. This complicated things, as we normally assign different parts of the sound to control different elements. We had to go through a laborious process of isolating parts of the soundtrack. Once this was achieved we wrote a script in 3DS Max that would allow us to evolve the structures according to different parts of the sound. We incorporated hand drawn maps and animations to create a complex world that looked hand-made. We are perfectionists and enjoy the creative process, so this project caused a lot of hair pulling; trying to control so many generative elements and pulling them seamlessly together. How did the video commission come about? We made some music videos for Mum and QT who are Fat Cat Records artists, and were contacted via them by Patrick from O/S/A/K/A records in Dublin. We had just finished a six month fellowship on the Scottish border in Berwick-Upon-Tweed, followed by a solo show, and were gearing up for a new sort of challenge. So timing was everything here. Does your work come from subject contexts, or are they more process/abstract driven ideas? Both; we started playing with computers during the first generation of current mainstream software and this put us in a great position in terms of learning the potential of the computer and exploring it as a medium. Back in 1999 we made a piece called Puffed Rice; we made the sound and then we found our own path through the computer where we could change an equivalent of a frame of the sound into image, revealing the data as both sound and image. This was pre ‘action’ in Photoshop and so was a very time consuming process. We were interested in what the computer visual language looked like. We still work with the raw material of the computer image in our live work; generating stripped back simple 3D forms to sculpt and draw in real-time, working with the innate material. In other works we have made site specific installations through fellowships and residencies. The starting point for these is our interest in the landscapes of our world, both natural and man-made. Through animation we reveal the physical world in flux; cities in motion and systems in chaos. Central to these works is the role of sound, which becomes synonymous with the image, as it creates, controls and deciphers it; exploring resonance, through the natural order of things. For example; in Inaudible Cities: Part One, a digital cityscape is built by the sound of an incoming electrical storm and in All the Time in the World we have used actual seismic data to re-animate the landscape of Northumberland. Have you any other favourite visual artists?